This is it, guys. This is the year I’m going to become so damn chill. As I’ve mentioned, I’m making a concerted effort to reduce my stress levels, both because I want to be a happier, calmer, more present and focused individual, and also because I’m hopeful that it’ll help with my TMJ (which has now been going strong now for a year. A YEAR, you guys.). When I first stated this as my goal, I got some great responses, and it sounds like a lot of you are interested in coming along for the ride. So, over the next few months, you’re going to hear all about what I’m trying and — most importantly — how well it works. I started out with a cleanse that incorporated meditation, and have continued implementing meditation and yoga as often as I can manage (which, happily, is more and more often these days, although still not exactly daily). Since then, I’ve added a couple new things: Headspace, an app and program designed to make meditation a little more accessible for modern living, and the ReLax Kit, a bio-sensor designed to help you better understand (and therefore better manage) tension and stressed based on feedback about your brainwaves, body posture and more. Headspace: Free to try for 10 days. What do you have to lose? Since I’m kind of a newbie to meditation (I really only tried it for the first time a few months ago), I am all for anything that claims to make it … well, I don’t know if easier is really the right term, but maybe less intimidating. I am not yet to the point of being able to simply sit in silence, alone with my thoughts, and have any sort of relaxing experience. Headspace is simple (which I liked right off the bat). You pop the app on your phone and take about 10 minutes out of each day to sit and listen to the guided meditation. And this isn’t a chant-y meditation set to new age music and gongs (not that there’s anything even slightly wrong with that!) — it’s just a dude (Andy Puddicombe) with an accent (I really liked it, but my husband found it a little grating) talking you through some very basic steps, eventually leading to a few seconds of quiet, unguided meditation. Likes: I found this really easy to use and also liked that it was just 10 minutes, as so many others I’ve looked into are longer and … well. I’ll get there, but 10 minutes was a good start. 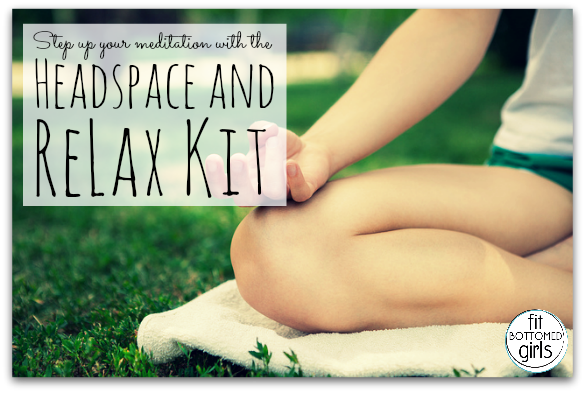 Plus, I learned some great basic meditation techniques that I can use on my own. Dislikes: Take10 got a little bit repetitive. I mean, that’s necessary to an extent since the point is to teach you how to do it and make it a habit, but I would’ve loved a little more variety. Also, I found that I have an easier time finding inner peace when there’s some music happening, so I ended up playing my own new age music in the background. 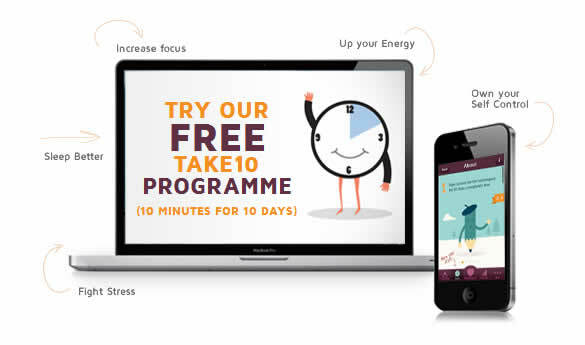 Fit Bottomed Line: I’d absolutely recommend Headspace Take10 to anyone interested in upping their meditation game. Since my husband and I had such different reactions to it, though, I would suggest checking out the free version before committing to a subscription (even though there is a money-back guarantee). Alright, this one is a little tougher to explain, but hear me out. The ReLax kit is basically a way for you to monitor and track your relaxation through your brainwaves and body posture by wearing a band with some electrodes and a sensor on your forehead, which transmits that data to a controller, which you can either use on its own by reading the LED light display, or plug into your computer and download an app to get more in-depth feedback and data. Basically, you wear it while doing one of the eight self exploration exercises outlined in the included booklet, and note how your results vary depending on the activity and your ability to focus and relax. Getting lots of reds and oranges indicates muscular and mental tension detected, while greens and blues show a low level of mental and muscular tension. The ReLax Kit runs $46.20, but there are no additional fees once you have the device. Likes: First off, the idea is just cool, especially for those of us who really like tangible evidence of progress (not always an easy thing with this mental stuff, you know?). Seeing how different types of breath and different postures — even different thoughts — affected my colors was fascinating. When focusing on relaxing, I could keep things pretty blue, but when my focus is elsewhere … not so much. Dislikes: As easy to understand as the feedback and data was, getting there was a different story. I did not find the instructions for setting up the sensor and driver and app and what-have-you easy to follow at all. The websites (there are two, I guess?) aren’t very user-friendly, and it wasn’t until I sat and watched the videos while also reading through the instruction manual and reading what I could find on the website that I finally figured it out. I mean, I’m not the techiest girl you’re ever going to find, but I’m no slouch, and boy, did I struggle here. I did, however, figure it out eventually with zero outside help, so there’s that. Also, there’s a section somewhere on the website (and no, I can’t find it again) that tells you that wearing this electrode headband thing is a fashion statement on its own. No. NO. It is not a fashion statement. I suppose you could wear it out and about under a hat or something, but … no. It is not like a sleek little FitBit that one might mistake for jewelry. Not even close. It is a sensor and electrodes on a string, and that’s exactly how it looks. Fit Bottomed Line: I’m a little more torn here, because while I love the idea and am excited to see my progress as I continue working through all the exercises, figuring out how to use it was a lot like pulling teeth. Still, for those who are deeply interested in learning how to better control their mental and muscular tension, this is a cool tool for less than $50. This article really resonated with me! I clench my teeth which exacerbates my TMJ. Why? I have no clue. I will be in yoga and all of the sudden I realize I am clenching my teeth like there is no tomorrow. (So much for the relaxation there, huh)? I tried taking a Stress Relief Complex supplement and thought it would be another gimmick, wouldn’t work, etc. So I took one pill, just one. I woke up in the morning with my mouth open, literally. I couldn’t believe it. For weeks I had been waking up in the morning clenching my teeth so hard that I thought my mouth-guard would break. Let’s just say my mouth guard had no risk of falling out because I was subconsciously keeping it in place. That Stress Relief Complex was shocking!